Franky the Fox an adorable young fox cub had what couldn’t exactly be termed a Bond like escape from a muddy spot of bother recently when he was pulled from a deep muddy hole on building site caked in mud. 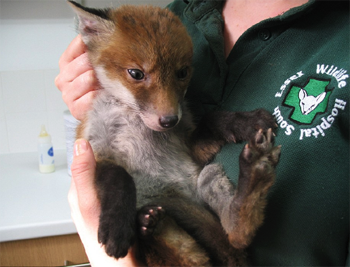 Four-month-old Franky the Fox who was rescued from an site close to London’s Canary Wharf, wasn’t apparently looking for a secret way into the London Olympics without paying he had just lost his way and fell into the deep hole and had little or no chance of escaping. Happily a kindly builder spotted Franky the Fox and his slimy predicament and phoned the South Essex Wildlife Hospital who arrived promptly on the scene to take care of Franky the Fox. 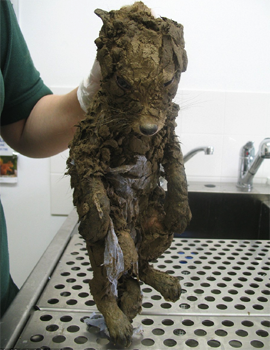 The only harm that was done was that Franky the Fox was covered in a thick layer of dried sludge from head to foot which as you can see washed off – eventually. After a lot of rest and even more food Franky the Fox will be released into the wild with the warning presumably, “Don’t go near any deep muddy holes!” Let’s hope that Franky the Fox remembers this important warning in the future.